← Aim For the Heart! I have tons of palettes in my makeup case (s) because they are so conveneien and east to carry on assignments or photo shoots. 2 of my favorite ones come from Urban Decay found Online or at Sephora or Ulta, retailing for $50 each and at first glance you might think they look similar, but the original NAKED has more gold and yellow and peach-bronze hues, where the NAKED 2 has cooler more taupe colors with some mild golds, matte colors, and more muted bronze colors. I really cant say that I prefe one over the other as I use them both very often at the same time. 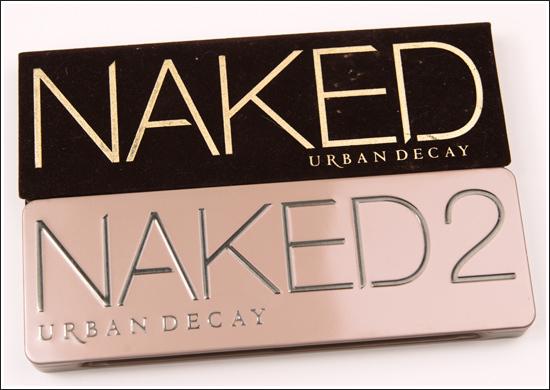 The naked palette: has a lot more shimmers, and more golden-gold-bronze hues, like the 3 middle colors. I love the steel blue, half-baked and Gunmetal. These are 2 Must haves for your kit! Posted on June 12, 2013, in Whats In The Bag??. Bookmark the permalink. 1 Comment.